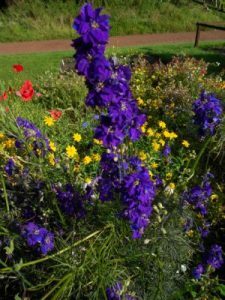 Larkspur is an easily grown annual that repays the cost of a packet of seed many times over. Sow early spring under glass and transplant into moist soil in a group of twenty or more for a stunning swathe of colour. 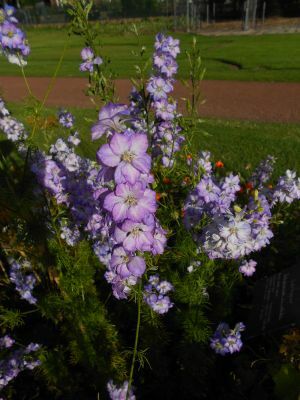 In the demonstration garden are two groups, the darker blue cultivar ‘Blue Spire’ growing in the student’s plots and the lighter blue Delphinium consolida or Consolida cultivar is planted within the herbology plots. Don’t fret about the Latin, look in a seed catalogue and choose a packet of seed for next year or if you want early flower spikes sow these annuals directly in the open ground in September. Both grow to a height of about 1.2m so allow room to develop.